In the midst of relocating across the country and becoming a first-time father this Fall, I had been asked by the esteemed Tavis Allison of Autarch to put some of my hedge-wizard illustration skills to work for one of their projects. I had the pleasure of being asked to develop a colored hex-map showing the region around James Maliszewski‘s infamous/legendary Dwimmermount. James had already enlisted the mapping mojo of the influential Rob Conley of Bat In The Attic to create a play-reference black and white map for the region around Dwimmermount proper, but Tavis called for a large colored map that could be printed on durable vinyl. It was to be sans locations and named areas so the map could function for mysterious player exploration and utilitarian play at the table much like the old wilderness survival map. I decided to make the thing entirely of scanned watercolor paint-strokes. If it was going to be in big printed color, I thought I would savor the opportunity and forgo using the color black for creating outlines or details and try and have it look like everything was painted on in color. 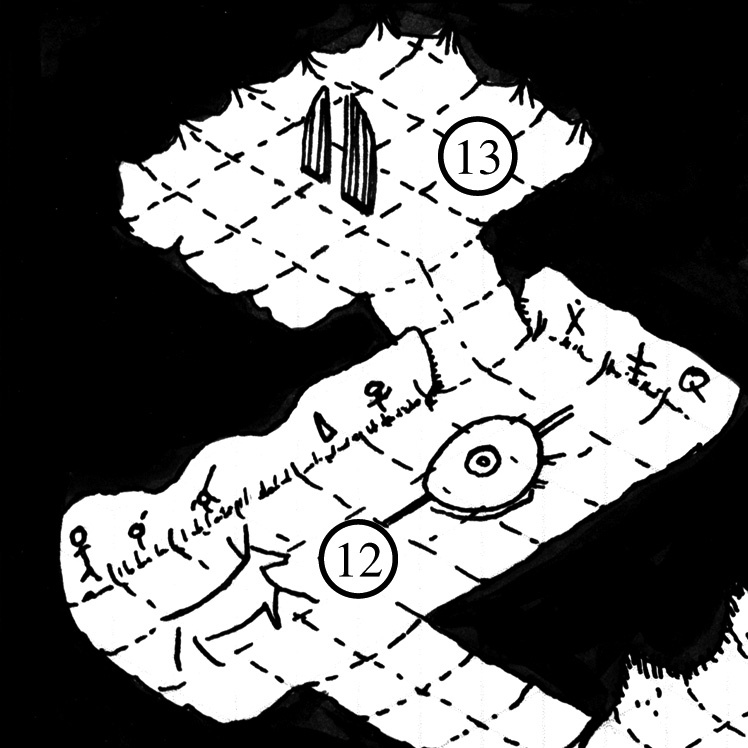 A lot of published game maps start life in digitized B&W and can have a “coloring book” feel to them. I wanted to see if the whole thing could be done with hand made colored strokes and textures. In the end you can still see the digital-ness of the whole affair, and I used black for putting the hexes on, but the intent is to have it organic/quirky enough that the machine qualities don’t register to the viewer. The raw painting used to create a “big” mountain pattern for use in GIMP. The steps were numerous and I won’t detail them unless there is substantial internet begging, but they involved much tracing, painting, scanning, buying a recycled socialist computer, pattern creation, GIMPing, Hawkwind, Ice Dragon, and beer. My goal next time is to create 4 inch sized hexes with oil paint on a wood panel. 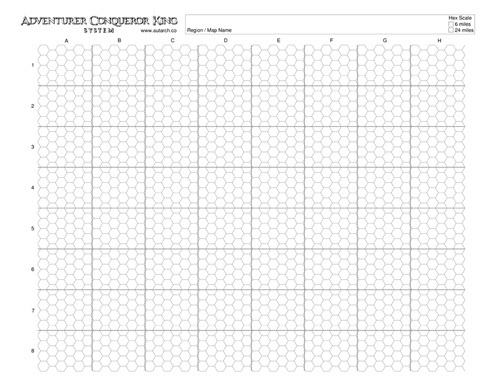 This “recent and amazing donation to the Play Generated Map and Document Archive (PlaGMaDA) project: A beautiful, hand-made homebrew addition to the classic TSR Against the Giants series” is not news to Boing Boing readers, but it bears repeating. Image from PlaGMaDA, courtesy of Tim Hutchings and The Scribe. I had the pleasure of seeing the original (thanks Tim!) and it is indeed a thing of beauty! You can download the whole module thanks to Rended Press, whose awesomeness (like that of retro-clone creators) is in no way diminished by depending on the earlier contributions of the as-yet-untracked-down GJC Modules, The Scribe who donated it to PlaGMaDA, and Tim who thus made it what to our wondering eyes should appear. The first rule of Games that Can’t Be Named is that we don’t talk about Games that Can’t Be Named. No, wait, that’s clearly not true. Maybe it’s that what happens in Vegas stays in Vegas? Anyway astute readers of the comments to that Boing Boing piece will note that Tim mentions that tonight’s Games that Can’t Be Named will be happening in partnership with PlaGMaDA. What does that mean? Will Tim be there and will he have the original “G2-squared” module with him? Sometimes the veil of secrecy conceals the fact that even I don’t know for sure! What I can say is that we will be at the Soho Gallery for Digital Art on 137 Sullivan St. tonight; next Wednesday, February 1st, we’ll be inaugurating the Brooklyn Strategist‘s new location at 333 Court Street and another game that can’t be named. 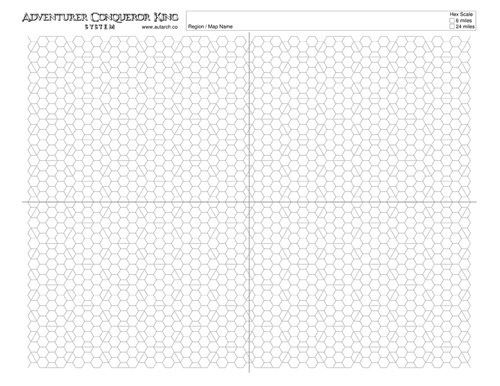 Also newsworthy: PlaGMaDA needs your help to bid on an auction of awesome DIY adventures and character sheets from the distant past. Having recently and very entertainingly been schooled in the ways of collectors, I won’t link to the auction itself, lest that drive up the price. However, below is a picture of the goodness in which we will all share if your donation allows PlaGMaDA to make the winning bid. Tim says the donations page is mostly for people wanting to contribute their gaming maps and documents to the archive, but it does have an email where you can contact him and pledge the financial support that PlaGMaDA needs to make acquisitions like this. a gamer and visual artist who often betrays the viewers’ sympathies and trust while delving into the history of film, minimal aesthetics, and chance based conflict resolution. He has shown work at the Kunsthalle Wien, The New Museum of Contemporary Art and Socrates Sculpture Park. Since I am passing on a request from Tim for help, I feel obliged to say that this thing about betraying trust must be some of that “not bad meaning bad but bad meaning good” art-world lingo; Tim’s sympathies lie with all things awesome and trusting him has always worked out well in my experience. at ozark1@hotmail.com, with FACT MAPS in the email title. What are you waiting for? Museumgoers and/or those looking to find Flood Control Dam #3 are awaiting your handiwork! That is, if you think that by awesome I mean a recreation of the art and design methods of late-seventies RPG game maps. Awesome in a way that Red versus Blue of the generic cold war armies on a Tactics II game board are awesome. 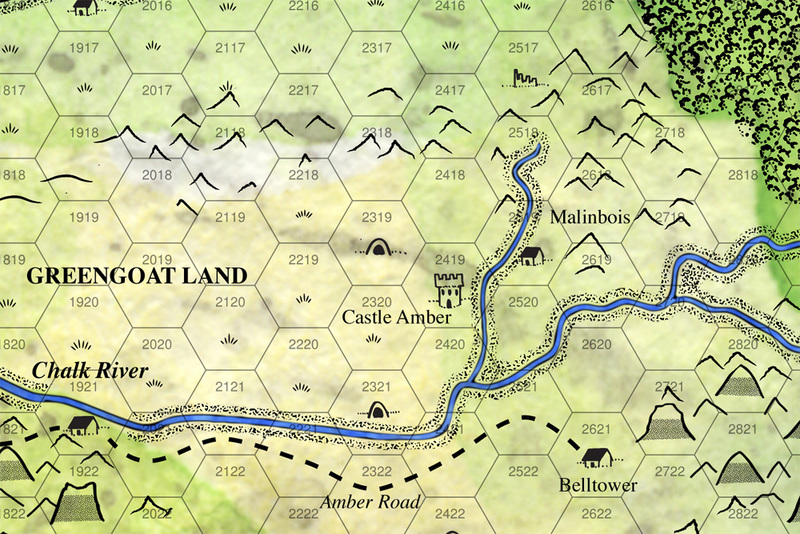 If you will recall from my last stint of map posting, I explained the whole process of generating a random and unique regional hex map for use in a starting sandbox style campaign. It was a homage (copy) of the same style of region maps that were put out by Judges Guild in the late seventies for their Wilderlands of High Fantasy series. 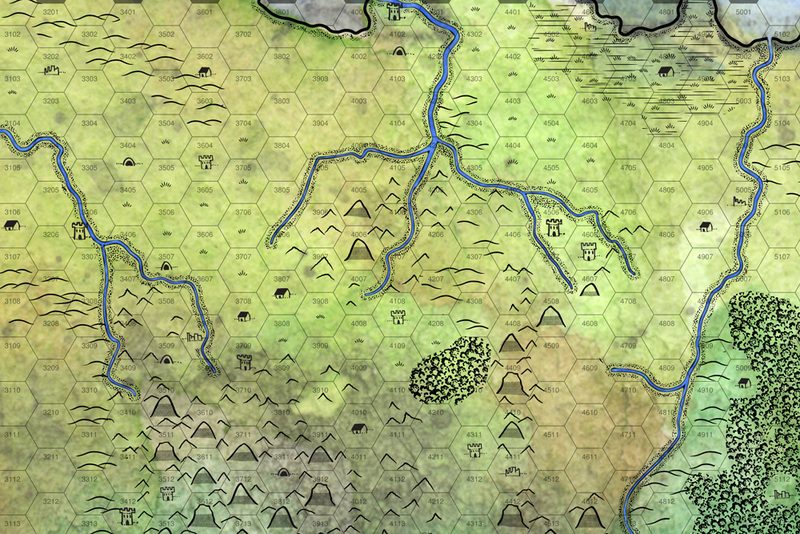 Towards the end of the process, I bemoaned the fact that I couldn’t exactly replicate their graphic style in my final map iteration. 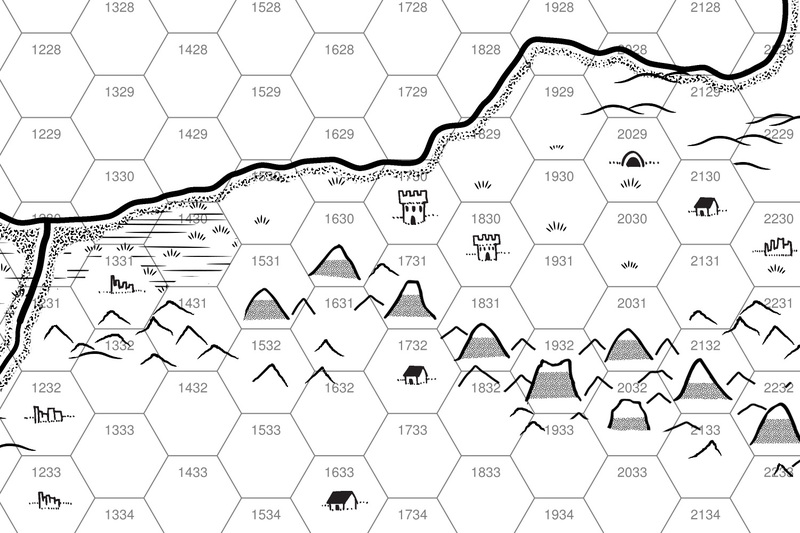 The designers at Judges Guild used a combination of hand-inking on a full size sheet and screen tone to produce their textures and shapes on their large 48″ x 36″ maps. Photo-mechanical printing to capture a full size drawn map seemed a little severe for my purposes and screen-tone is generally only used in Japanese manga as a carry over from pre-digital illustration days. 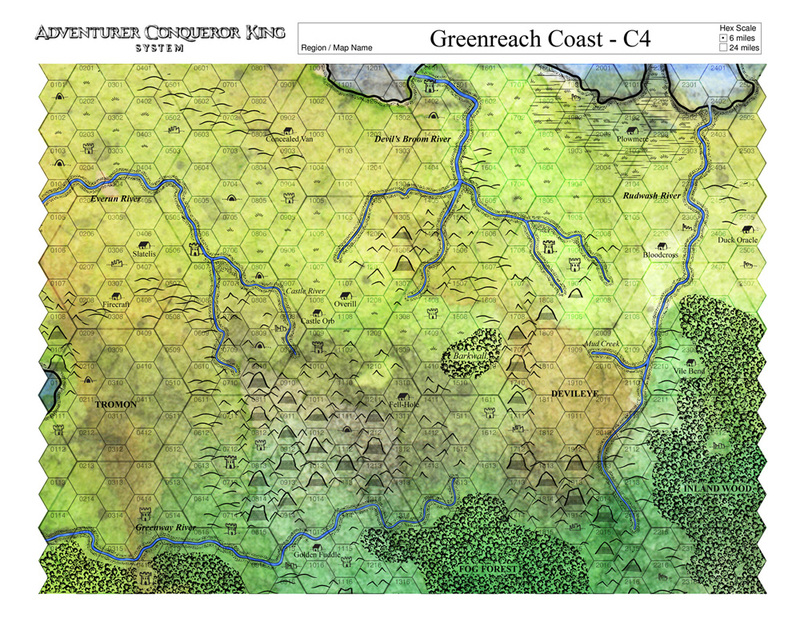 I had already found some digital textures on the internet that someone had lifted off of old wargame designs that would take care of my forests and rough patches. Those were good, but there were still a bunch of tone patterns that were impossible to locate, to say nothing about the mountains and hills that were hand drawn directly on the old JG maps. So to satisfy my own obsessive sense of needless design (it is a DM eyes only map, no one will get to see it. ), I created a bunch of repeating digital patterns to simulate the inking and screen-tone that I could find on the old maps and loaded them into my imaging software for my personal mapping enjoyment. And the good news is that I am giving them all to you. 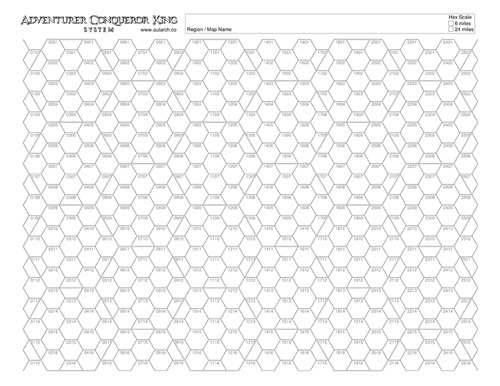 All the patterns are scaled to perfectly fit the 48″ x 36″ 150 dpi hex region map that I am also including in the attached zip file. See the included readme for further instructions about how to use them in your graphics program. However be forewarned, it still takes a lot of fiddling with layers and brushing and erasing hills to get it to look good. It is no Campaign Cartorapher. It looks particularly good when you lay the whole business over your enlarged watercolor painting. But it also looks just fine in B&W like the old Judges Guild maps. Enjoy and map-on through your 70’s fantasy lands. Listening to Hawkwind helps the process along.